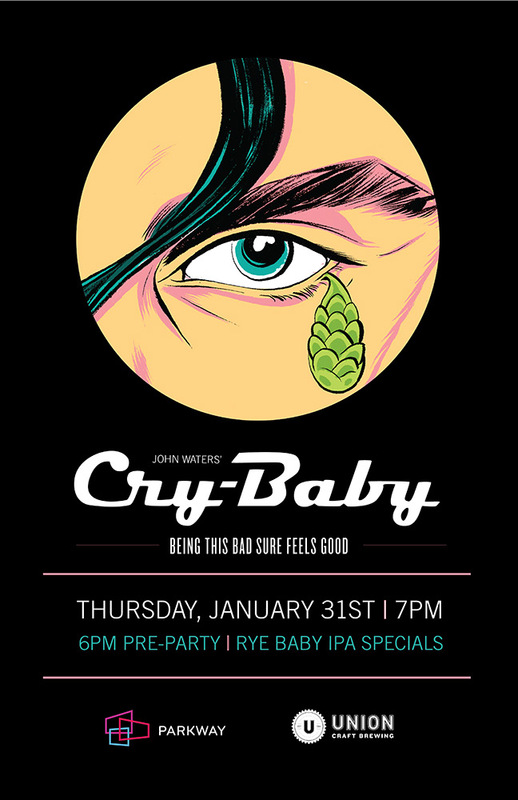 Come join Union Craft Brewing and the Parkway Theatre for a special screening of John Waters’ Cry-Baby, including a pre-film party and Rye Baby IPA specials! Eisenhower is President. Rock ‘n’ Roll is king. And Wade “Cry-Baby” Walker is the baddest hood in his high school. Johnny Depp heads up a supercool cast as the irresistible bad boy whose amazing ability to shed one single tear drives all the girls wild — especially Allison Vernon Williams (Amy Locane), a rich, beautiful “square” who finds herself uncontrollably drawn to the dreamy juvenile delinquent and his forbidden world of rockabilly music, fast cars and faster women. It’s the hysterical high-throttle world of 1954 in director John Waters’ outrageous musical comedy. And remember to show up early for our pre-film party — the first 30 attendees to arrive will receive an awesome Rye Baby pocket comb!